Angel traps are a special type of sigil that can be used to trap angels akin to a devil's trap or reaper trap. After capturing Gadreel in a ring of holy fire, Sam and Dean move the angel to an abandoned building, and place him in an angel trap allowing for Dean to get information out of him. 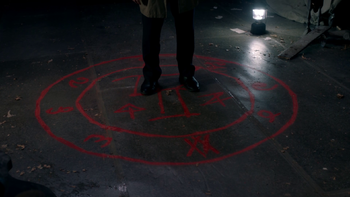 When summoning Lucifer to use the angel suppressing sigil to allow Castiel to expel him; Sam, Dean, Crowley and Rowena take extra precaution by painting an angel trap made from sigils recovered by the Book of the Damned around one of the suppressing sigils, as well as using a ring of holy fire to keep Lucifer in place. However, Lucifer proves to be too powerful and is able to eventually bypass all the warding used to contain him. This page was last edited on 6 October 2017, at 01:33.